The Platte Avenue over Sand Creek Bridge project focuses on bridge replacement, accommodating the Sand Creek Trail along the east side of the creek under the bridge and signalizing the intersection at Space Center Drive. The main priority of the project is safety improvements. Additional priorities include lessening the environmental impact and designing for additional lanes on the bridge for the flexibility of accommodating future growth. The project will also accommodate the future Sand Creek Regional Trail under the Platte Avenue bridge and the addition of sidewalks along the north and south sides of Platte Avenue over the creek. The approximate construction limits for the replacement of the eastbound and westbound Platte Avenue Bridges over Sand Creek is from Troy Hill Road to Babcock Road. The parallel bridges on Platte Avenue (between Wooten Road and Powers Boulevard) were built in 1956 and are approaching the end of their service life. Knowing this, the City of Colorado Springs developed the Platte Avenue Over Sand Creek Conceptual Design Report in 2003 to define the project area, project goals, alternative and challenges. The 2003 report provided a head start for this bridge project. A 2008 flooding of Sand Creek caused the piers to be undermined and crystalline deposits of salt and rust staining have formed on the concrete surfaces. Subsequent de-icing chemicals have also contributed to the degradation of the structures to the point that it is necessary for the City to move forward with the bridge replacement project and safety improvements as quickly as possible. There are several significant project challenges to replacing the bridge structures: (a) Sand Creek issues, (b) accommodating the future Sand Creek Regional Trail, and (c) construction phasing. The concept report indicates significant approach work due to the high potential for raising the bridges when they are replaced. This will likely require reconstruction of the intersection with Space Center Drive. Challenges of Sand Creek and the trail involve how to best manage the bridge configuration for a waterway with volatile erosion characteristics while providing for the future trail. The City has already invested in stabilizing this portion of Sand Creek and will be constructing additional channel stabilization measures downstream in early 2018 using FEMA funding. As a major east/west corridor, construction of the new Platte Avenue bridges will be staggered with other improvement projects in the area. Some improvements are already under construction, while other projects are in the works, and funding for others is still being pursued. Driven by the condition of the existing Platte Avenue eastbound and west bound bridges over Sand Creek, both bridges will be replaced at one time for a cost-effective investment. The project will also consider and plan for the future capacity improvements along the Platte Avenue Corridor. Funding for this project totals $14,035,942. Sand Creek channel stabilization measures using FEMA funding will take place downstream from the Platte Avenue bridges starting in early 2018. This planning study focuses on the challenges of connecting Platte Avenue to I-25, as detailed in the City of Colorado Springs East/West Mobility Study completed in 2000. This planning study focuses on the challenges along Platte Avenue from Chelton Road to Wahsatch Avenue, the east entrance of downtown Colorado Springs. 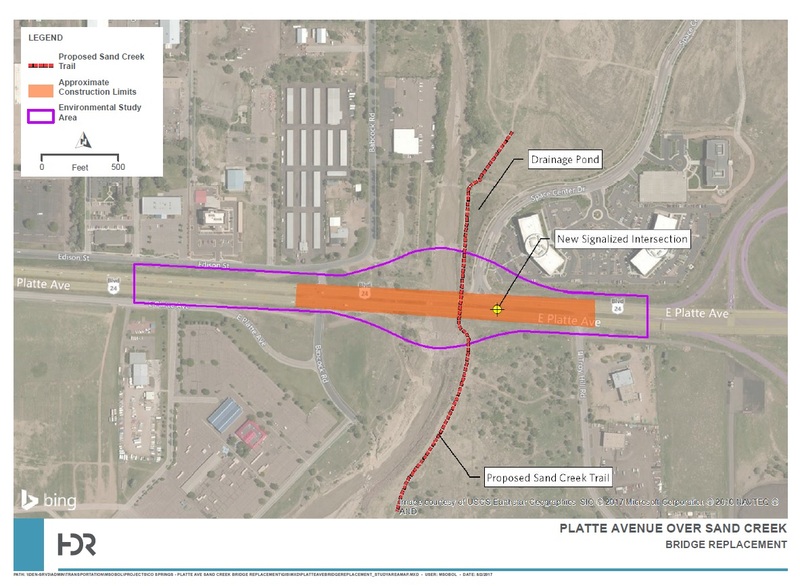 A Public Open House for the Platte over Sand Creek bridge project was held April 10, 2018 from 5:30 - 7:30 p.m. at the Calvary Chapel, 5070 Edison Avenue, Colorado Springs. Documents from the meeting are posted below. Another Open House is anticipated prior to the start of construction. The environmental and preliminary Design phase began in June 2017 and will continue through the first quarter of 2018. Construction for the project is anticipated to begin early 2019, continuing through 2021. (Schedule subject to change).